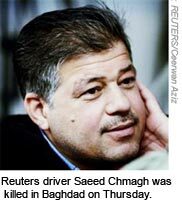 New York, July 12, 2007—­The Committee to Protect Journalists mourns the deaths today of a Reuters photographer and driver, who were killed in eastern Baghdad during what witnesses described as a U.S. helicopter attack. 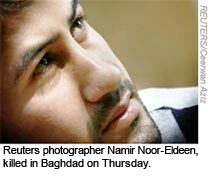 Photographer Namir Noor-Eldeen, 22, and driver and camera assistant Saeed Chmagh, 40, were killed by a U.S. strike that claimed the lives of nine other Iraqis in the Al-Amin al-Thaniyah neighborhood, Reuters reported, citing a preliminary Iraqi police report. The news agency said it obtained a photocopy of the report, which was issued by the Al-Rashad police station based on witness accounts. “We are deeply saddened by the loss of Namir Noor-Eldeen and Saeed Chmagh and offer our deepest condolences to their families,” CPJ Executive Director Joel Simon said. “We call on U.S. military to quickly provide details about this deadly incident”. Witnesses told Reuters that Noor-Eldeen and Chmagh arrived in the neighborhood about the time a U.S. helicopter fired on a minivan. Video footage showed that the minivan was destroyed, Reuters reported. Initial reports suggested that the air strike took place during clashes between U.S. forces and insurgents, but witnesses later said there were no clashes, according to Reuters. The Multi-National Force-Iraq press desk in Baghdad did not immediately respond to CPJ’s telephone and e-mail inquiries seeking comment. 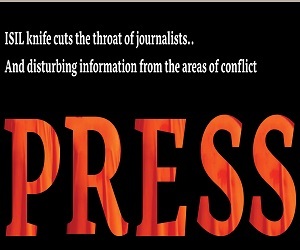 In all, at least 15 journalists and three media support staffers have been killed by U.S. forces’ fire in Iraq since the war began in March 2003. Chmagh is survived by his wife and four children, the news agency said. Noor-Eldeen was single. Four other Reuters employees have been killed on assignment in Iraq, the largest loss suffered by an international news organization in the conflict, CPJ research shows. 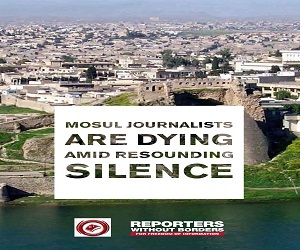 In all, at least 109 journalists and 40 media support staffers have been killed in Iraq since the U.S.-led invasion in March 2003, making it the deadliest conflict for the press in CPJ’s 26-year history. 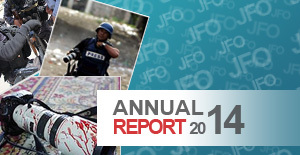 More than 80 percent of media deaths have been Iraqis.